Offering for your selection Three Victorian Barber Bottles two bottles are made of Clamsbroth glass. 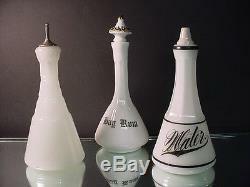 One is umarked the other is marked in black "Water", the third bottle is Milk Glass and marked Bay Rum in black print. These are a wonderful selection of Late Victorian Barber Bottles. Plain Bottle marked with E. Easily found in reference materials on Barber Bottles. No chips, cracks, or restorations, damage to stopper on Water Barber Bottle. This will be a nice addition to your Clamsbroth or Milk Glass Bottles, or Barber Bottle Collection. If you would like to have your item insured, please let us know, and we will send a revised invoice. Your item(s) will be packed as safely as possible. The item "3 Victorian Barber Bottles 2 Clamsbroth Plain & Water, & Milk Glass Bay Rum" is in sale since Tuesday, January 5, 2016. This item is in the category "Pottery & Glass\Glass\Art Glass\North American\Other North American Art Glass". The seller is "impressionism_mn" and is located in Saint Paul, Minnesota. This item can be shipped to United States, Canada, United Kingdom, Denmark, Romania, Slovakia, Bulgaria, Czech republic, Finland, Hungary, Latvia, Lithuania, Malta, Estonia, Australia, Greece, Portugal, Cyprus, Slovenia, Japan, China, Sweden, South Korea, Indonesia, Taiwan, South africa, Thailand, Belgium, France, Hong Kong, Ireland, Netherlands, Poland, Spain, Italy, Germany, Austria, Israel, Mexico, New Zealand, Philippines, Singapore, Switzerland, Norway, Saudi arabia, Ukraine, United arab emirates, Qatar, Kuwait, Bahrain, Croatia, Malaysia, Brazil, Chile, Colombia, Costa rica, Dominican republic, Panama, Trinidad and tobago, Guatemala, El salvador, Honduras, Jamaica, Antigua and barbuda, Aruba, Belize, Dominica, Grenada, Saint kitts and nevis, Saint lucia, Montserrat, Turks and caicos islands, Barbados, Bangladesh, Bermuda, Brunei darussalam, Bolivia, Ecuador, Egypt, French guiana, Guernsey, Gibraltar, Guadeloupe, Iceland, Jersey, Jordan, Cambodia, Cayman islands, Liechtenstein, Sri lanka, Luxembourg, Monaco, Macao, Martinique, Maldives, Nicaragua, Oman, Peru, Pakistan, Paraguay, Reunion.